In this post I will share with you my step-by-step guide to Twitter for local business. Because most people’s impression of Twitter is that it is for celebrities, you can be forgiven for thinking that it doesn’t apply to Local Business. But when used correctly, Twitter can be an amazing way to get a steady stream of local leads for your business. 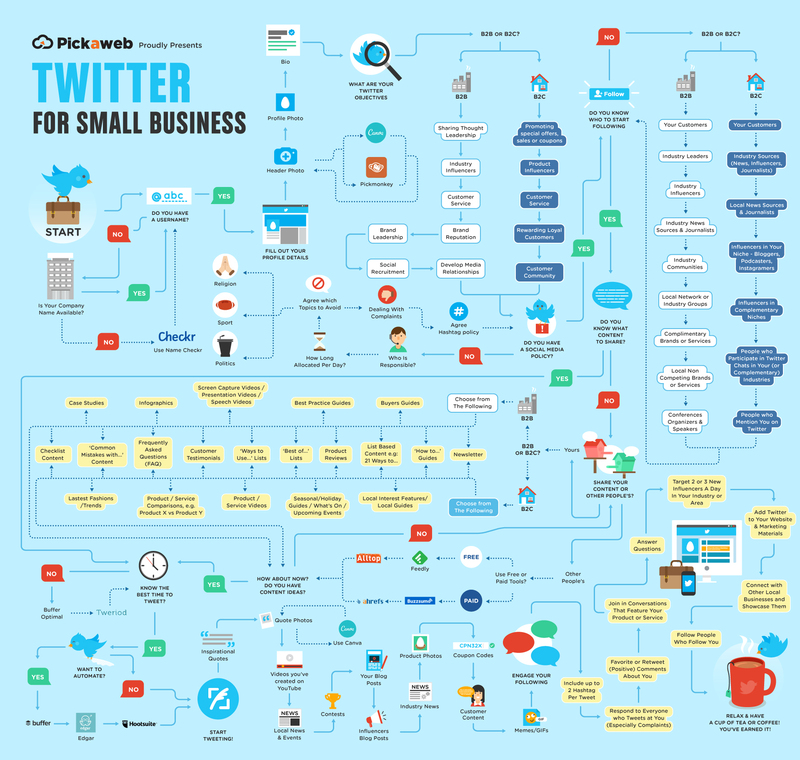 So if you want to tap into the power of Twitter for Local Business then this guide is for you. We all know just how important being on social media is today. It’s where you can find potential customers, promote your brand, and build authority online. And while the “big” brands have plenty of time, people, and resources to have a dedicated social media team, the situation isn’t quite the same for most small and local businesses. Which is exactly the reason why so many small and local businesses have struggled to get going with Twitter. That’s the purpose of this guide. We want to show you step by step how you can get your Twitter account up and running. This is a lot more than just “sign up and tweet” instead, you’ll learn how to optimize your profile, how to find the right people to connect with, and how to grow your account in as little as 15 minutes a day. First things first, go to Twitter.com to get started. It won’t be long before you have to make your first major decision: what your user name is going to be. You want to pick a name that is clearly identifiable as you or your brand. This could be the name of your business, or your own name, if that is easily recognized as the name of your brand. For example, if you run Chestnut Book Shop, a great choice is going to be @chestnutbooks. That way, your customers will know right away this handle belongs to your brand. Keep in mind your handle is going to be limited to 15 characters. Twitter will help you out there, they let you know if your preferred username is taken, they will also give you a few helpful suggestions as well. If you want to save a bit of time, use a tool like Namecheckr to easily see if your chosen username is available. Once you’ve chosen your username, follow along with the prompts. Voila, you’ve got your account up and running! But, you’re not quite done yet. You want to everything you can to optimize your account to ensure your customers can easily find you online. There are a number of things you want to pay attention to when setting up your profile. We’ll cover the parts that you really want to pay attention to. You can use your own creativity and a tools like Canva or PicMonkey to create your own header photos that include things like an image of your shop, or an image of some of your work, and your business name and details. Include your website URL and phone number, for instance. If you don’t have the time or the know how to create your own header, use 99 Designs or even Fiverr to hire someone who can create a header for you. Be sure to give instructions as to what you’d like listed in the photo. This post from HubSpot has a number of great examples of headers you can use for inspiration. For your profile photo don’t make it too detailed, this photo should be clear and quite easy to see. Your best bet is to use your brand’s logo, since you want to be as consistent as possible across brands. This is the other place where you want to pay the most attention in your profile. People will be able to search for your brand using the information you post here. Your bio will also show up in search engine results for your brand or username, so it’s key to think about this in terms of SEO (search engine optimization) as well. So include things that are going to attract and interest potential customers in 160 characters. Don’t forget to include a call to action also (i.e. “visit our website). Before you get too deep into Twitter, take a minute and think about your Twitter objectives. Social media should be an important part of your overall content marketing plan, so you want to have a solid strategy for how you are going to use Twitter to promote and distribute your content, as well as drive traffic to your business, increase engagement, and build up your authority. You want to ensure that you’re setting the stage to see a nice return on investment when it comes to the time you put into Twitter. Now, one thing to keep in mind is that your objectives are going to be different based on the type of business you have and the types of customers you serve. We’ll look at each. For a business to business (B2B) brand, customers are going to be other brands. So some key objectives are going to center around things like growing authority in a particular niche or industry as well as driving traffic to your site. While it’s certainly true that a B2B and B2C brand can share certain objectives when it comes to setting up their Twitter strategy, there are some important distinctions. Here, a B2C brand should really be focused on interaction and engagement with their potential customers. Once you have a handful of objectives set for your brand, it makes it much easier to know exactly who you want to follow on Twitter and interact with, as well as what type of content you want to share as well. So, don’t skip out on this part. It’s always a good idea to have a solid social media policy in place before you get started. Keep in mind this can always be tweaked and improved upon later as you (or your team) get more comfortable with social media. The policy by no means has to be in depth, but you want to have a few guidelines set in place to cover general rules. Smart things to include would be any topics that should be avoided, these would include anything that might be a controversial subject like politics or religion. How to respond to negative interactions or comments, and even the type of tone to take in tweets. It might seem like something unnecessary, but many brands have been sunk by bad PR after having an errant tweet go out. While many such infractions can be minor, the last thing you need to worry about is a very angry customer base, or even a lawsuit from a mistaken tweet. This really goes hand in hand with the above step. Because just as it’s very important to have a Twitter policy, you also want to be sure to know who is responsible for the social media duties for your brand. There are a couple of important reasons for this. Most importantly, you want to maintain a consistent voice across your social media platforms. If a number of different people have access to the Twitter account and all approach tweeting a different way, with different styles and tones, then that can actually end up confusing the customer. Avoid that by assigning the role to a specific person. If you run your business on your own, then this is pretty easy, you will be the designated “tweeter” for your brand. If you have a larger brand that has a few people with access to Twitter, then be sure to highlight your social media policy amongst all of them. Here, you can also assign specific roles within Twitter. For example, one person could only tweet out with respect to interacting with customers for specific customer service needs. There are two main types of content you want to gather. First, your own content, and also high quality educational, entertaining, and relevant content from other sites and brands that your target customer will really respond to. Feedly – Allows you to compile feeds from a variety of online sources that you can easily then load into your Twitter sharing tools. BuzzSumo – Use this tool to find the most shared content by keyword, website, or influencer, you can also use it for your own content creation ideas. AllTop – Visit AllTop to find the most popular stories both online and within a category that you can share. A blog should be a huge component of your overall content marketing strategy. If you do have one, then this is where you are going to be pulling from quite a bit to share on your Twitter account. Here again, we can break this down by B2C brands vs. B2B brands when it comes to the types of content to share. When it comes to creating blog posts, you can never go wrong with anything that is going to help your ideal customer and build your own authority within your industry. Remember to look at other content you can share from what you’ve already got on your website or your inbox, it doesn’t just have to be about blog posts. There are no shortage of available topics or content for a B2C business blog. Here is where you want to educate your customers and help them fall in love with your brand. If you’re struggling for topics, use crowdsourced content around your industry that ties back to your product or service. Growing a social media channel seems daunting to many, but even more so to small business owners who are typically quite busy and wear a number of hats within the organization. There are tools that can help. Using these tools can help you share both your own content (new and old) as well as other content that will engage and interest your core audience consistently. Buffer – Allows you to easily share content across a number of social media channels at set times, also has a very useful Chrome extension to easily add curated content. Edgar – Lets you share content across a number of social media channels and has a library system for you to consistently share evergreen content at set times. TweetDeck – TweetDeck is a Twitter specific tool that allows you to easily set and schedule tweets, monitor lists, reply to followers, and retweet others. Using these tools are going to help you take care of one part of the equation, getting your tweets out there. Next, you want to be sure you’re scheduling your tweets at the best possible times for the most engagement and views. Keep in mind, as you tweet more, the best times to tweet are likely to change, so re-check your schedule on a quarterly basis to make sure it’s up to date. Buffer Optimal Scheduling – Lets you know the optimal times to post for accounts linked to your Buffer account. Tweriod – Allows you to see when the best time to tweet is for your brand, based on both your tweets and the tweets of your followers. For even more Twitter tools, check out this list. Once you’ve got your content scheduled, you can focus your time on Twitter to interacting and engaging with followers and customers and following your Twitter objectives. This part of your Twitter strategy shouldn’t take long. One way to tackle this in an organized way is to set it in your calendar. Schedule yourself anywhere from 10 to 30 minutes a day as your “social media engagement block.” You could do it all at once, or say 10 minutes in the morning and 10 minutes at lunch. In this time don’t worry about sharing any new content, this is what your automation is for, instead you want to focus this time on speaking directly with customers, influencers, industry leaders, and followers. This is where you truly work on connecting and engaging with others (we’ll cover a bit more of the “how to” later in this post). It’s the engagement that is going to grow your brand. A big part of success on Twitter is following the right people. You don’t want to just go around following people willy nilly, that’s not going to help your brand. You have a strategy and Twitter objectives you want to hit, remember? Who to follow is going to be different depending on what type of brand you are and what kinds of products or services you provide. So, once again, let’s break things up into B2B and B2C to make things easier. To start, you want to remember that a big goal is to build your authority on Twitter, so you’ll want to follow what’s going on in your niche or industry. A B2C brand has a bit more flexibility when it comes to adding followers on Twitter, especially locally. Once you start adding more people to follow, chances are you’ll start spotting new sites, brands, news sources, and influencers you can keep following that pop up frequently. Are you itching to start tweeting by now? By the time you’ve gotten to this step, you’re in very good shape. You’ve got a plan to put in place, you’ve optimized your profile, you’ve created content to share, you’ve automated the process and set up a schedule, and you’ve followed the right people. Now, you can start actually tweeting. While you always want to keep a proper and professional tone, don’t be afraid to have a little bit of fun when it comes to Twitter. People often respond most positively to brands that are willing to showcase their personality online. Here are a few more examples from Social Media Examiner. Create a Twitter account that your customers will fall in love with and be excited to see what you come up with next. Far too many brands ignore this part, they simply share content and forget about engaging. Not only is it boring, but it doesn’t make customers feel very warm and fuzzy, does it? Creating engagement is all about being willing to communicate and sharing some personality. You can find out quite a bit about how you brand is doing online by doing a simple search on Twitter. This opens you up to a ton of ways to engage, so during your scheduled engagement time, be sure to include searches for your brand name, local area, and specific keywords for your niche or industry. Add your Twitter username to your website, email, newsletters, etc. These are just a few tips, but if you consistently spend time on a daily basis focused on growing your Twitter following, posting great content, and engaging with others, then you’re going to see results, even in as little as a few minutes a day. We hope you have found this post useful on how to use Twitter for business.